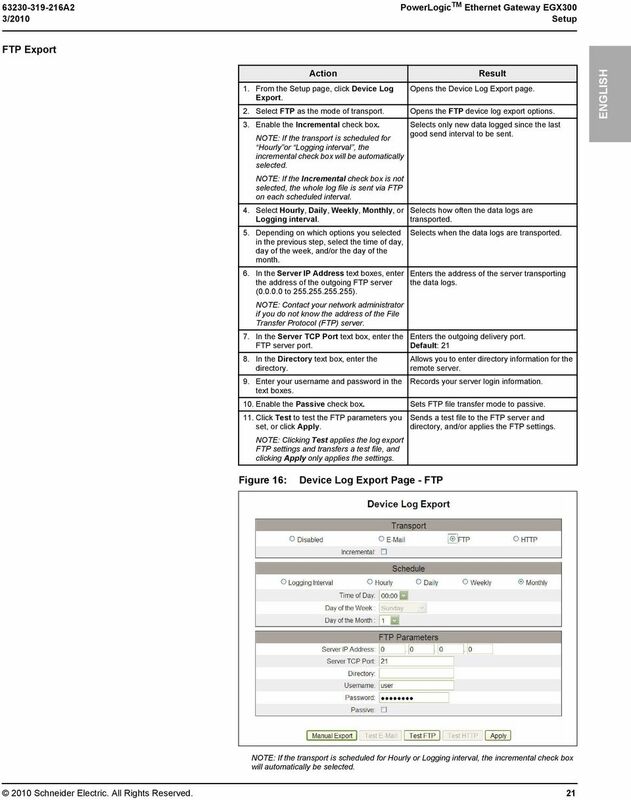 Download "Device Log Export ENGLISH"
2 A2 Setup 3/2010 day of the week, and/or the day of the month. 6. In the From Address text box, type the e- mail address of the person administering the device. NOTE: A From address is required because most SMTP servers require it. 7. In the To Addresses text boxes, type the addresses (5 maximum) that will be receiving the data logs (one address per text box). 8. In the Server IP Address text boxes, enter the address of the outgoing mail server ( to ). if you do not know the address of the Simple Mail Transfer Protocol (SMTP) server. 9. In the Server TCP Port text box, enter the outgoing mail server delivery port. 10. 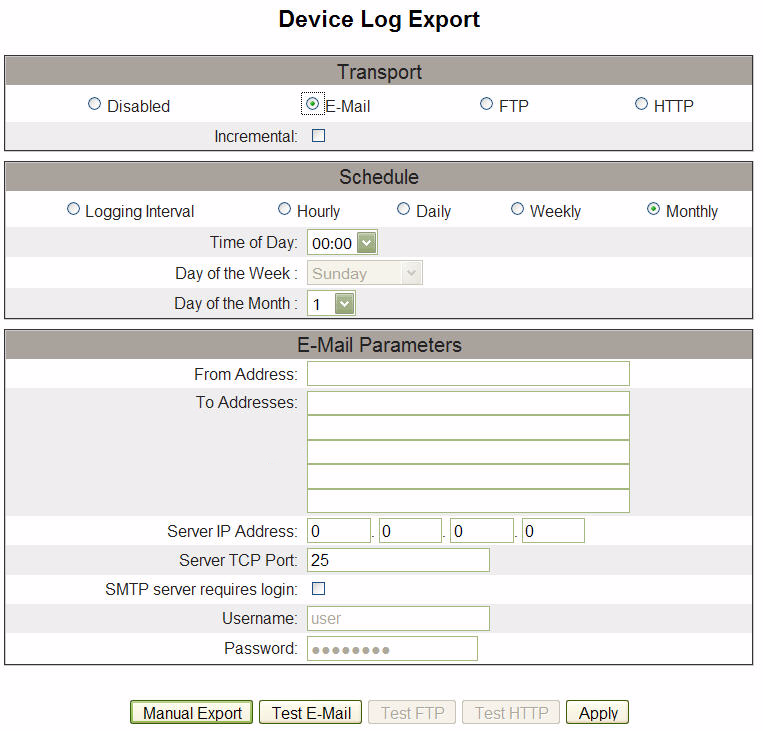 If the SMTP server requires login information, enable the SMTP server requires login check box. NOTE: The EGX supports Plain, Login, CRAM-MD5, and Digest-MD5 access authentication. 11. If you have checked the SMTP server requires login check box, enter your username and password in the text boxes. 12. Click Test to send a test using the parameters you set, or click Apply. NOTE: Clicking Test applies the log export settings and sends a test , and clicking Apply only applies the settings. Selects when the data logs are sent. Enters from whom the was sent. Enters the addresses of the recipients Enters the address of the server delivering the data logs. Enters the outgoing mail server delivery port. Default: 25 Allows you to enter SMTP server login information. 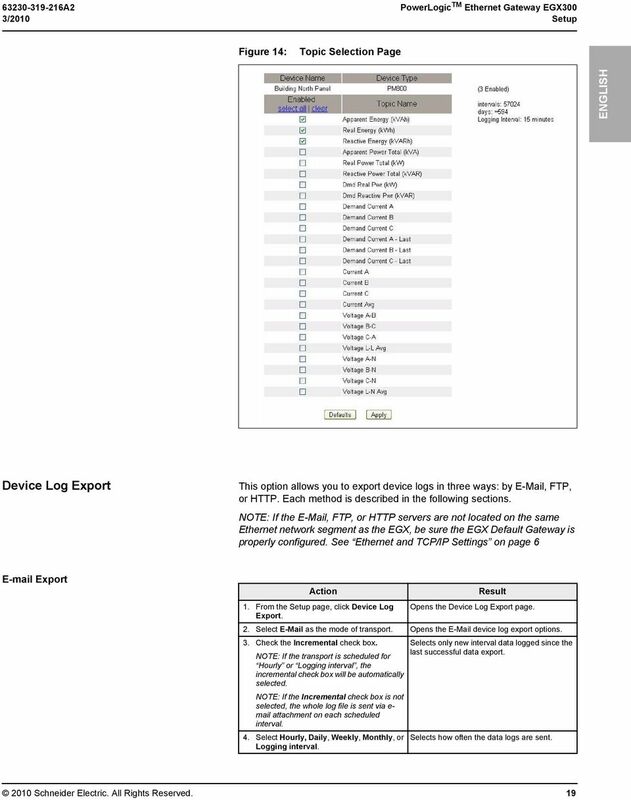 Records your SMTP server login information. Sends a test , and/or applies the log export settings. 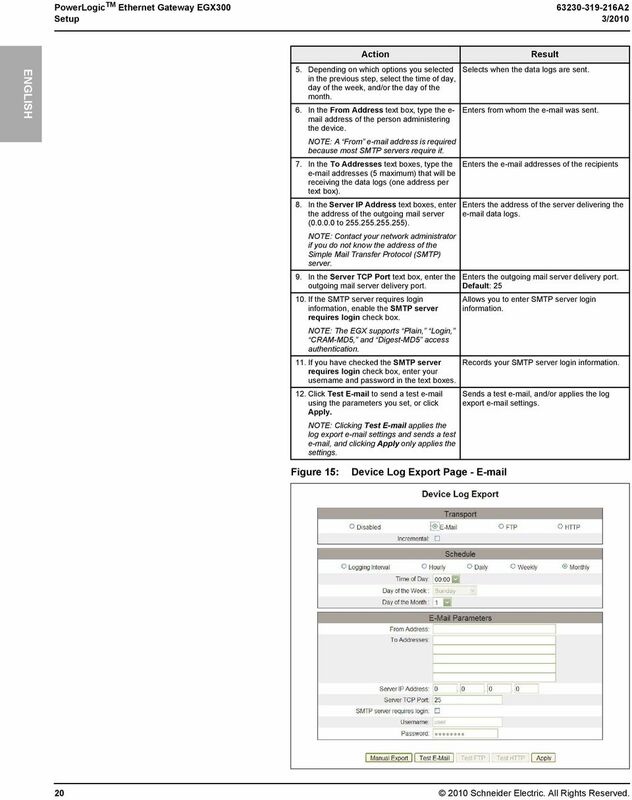 Figure 15: Device Log Export Page Schneider Electric. All Rights Reserved. 4 A2 Setup 3/2010 HTTP Export 2. Select HTTP as the mode of transport. Opens the HTTP device log export options. 3. Enable the Incremental check box. 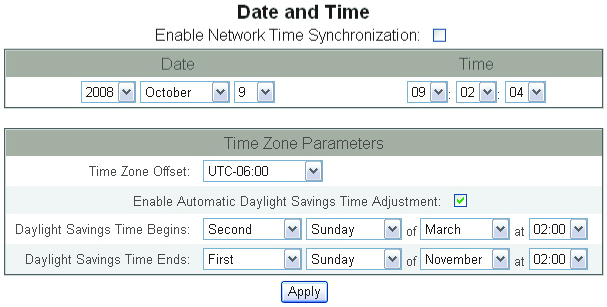 Hourly or Logging interval, the selected, the whole log file is sent via HTTP on each scheduled interval. day of the week, and/or day of the month. 6. In the Server IP Address text boxes, enter the address of the HTTP server ( to ). if you do not know the address of the Hyper Text Transfer Protocol (HTTP) server. 7. In the Server TCP Port text box, enter the HTTP server port. 8. In the Path text box, enter the path to the server script the web server will execute as a result of the EGX posting data to it. 9. In the Field Name box, enter the name under which the web server will expect the file name. NOTE: If there is no such requirement, use the default value datafile In the Host Name box, enter the domain name of the host. 11. Enter your user name and password in the text boxes. 12. Click Test to test the HTTP parameters you set, or click Apply. 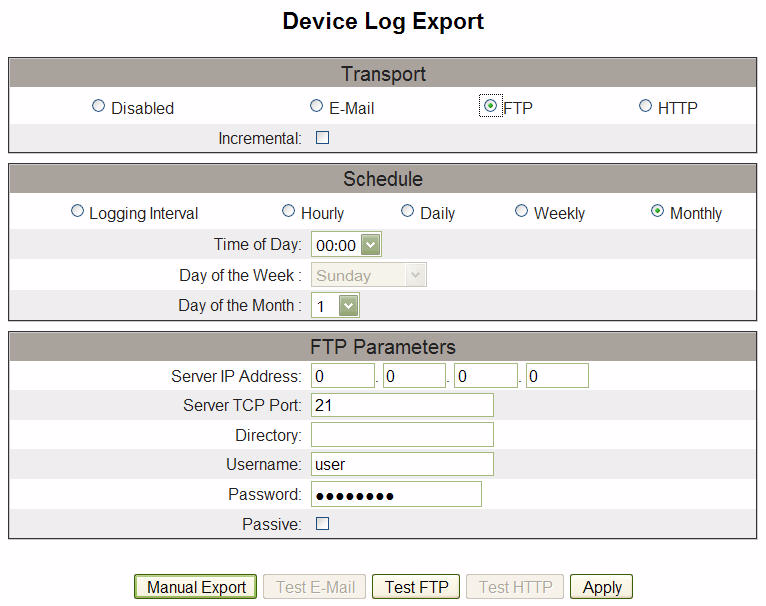 NOTE: Clicking Test applies the log export HTTP settings and transfers a test file. Clicking Apply only applies the settings. 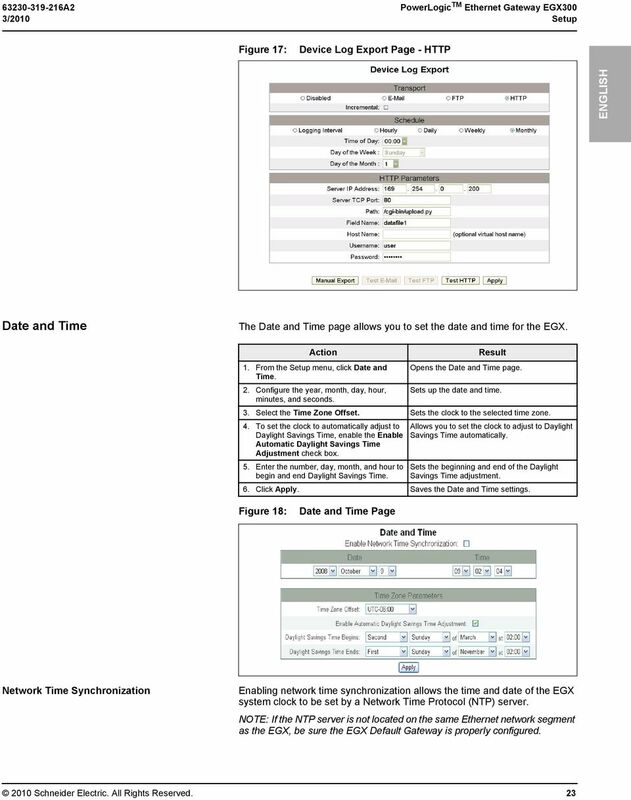 Selects only new data logged since the last good send interval to be sent. Selects how often the data logs are transported. Selects when the data logs are transported. Enters the address of the server transporting the data logs. Enters the outgoing delivery port. Default: 80 Enters the server script path. Allows the EGX to push files to an existing WWW server script. Identifies a specific host on the WWW server if it is hosting multiple domains on a single IP address. (Blank by default) Records your server login information. Sends a test file to the HTTP server and directory, and/or applies the HTTP settings Schneider Electric. All Rights Reserved. Chapter 3 Restricting Access From Your Network This chapter describes how to use the content filtering and reporting features of the RangeMax Dual Band Wireless-N Router WNDR3300 to protect your network. Manual. IP Sensor and Watchdog IPSW2210. I P S W 2 2 1 0 M a n u a l P a g e 1. 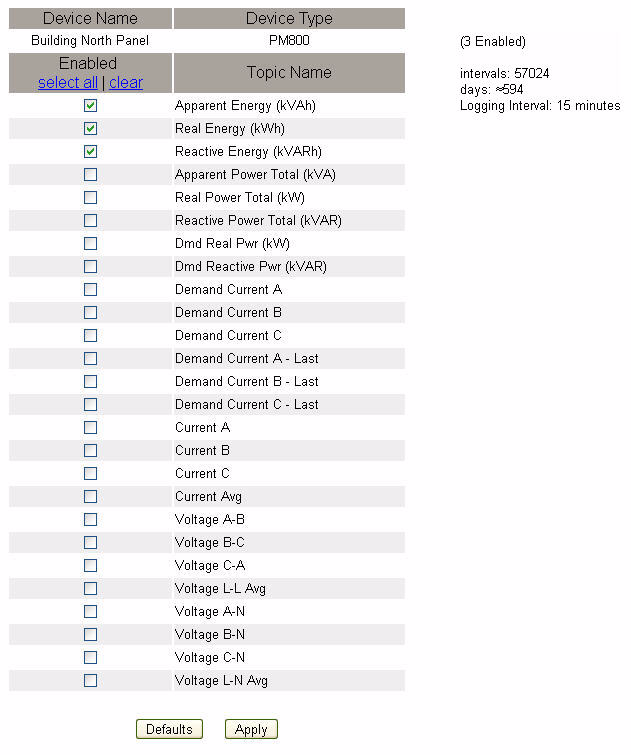 Relay Output. Power input. 12VDC adapter LED Indicators. 2 Dry. Alert Notification of Critical Results (ANCR) Public Domain Deployment Instructions Server Prerequisites Internet Information Server (IIS). It may be enabled in Windows Features (see Enabling IIS section). 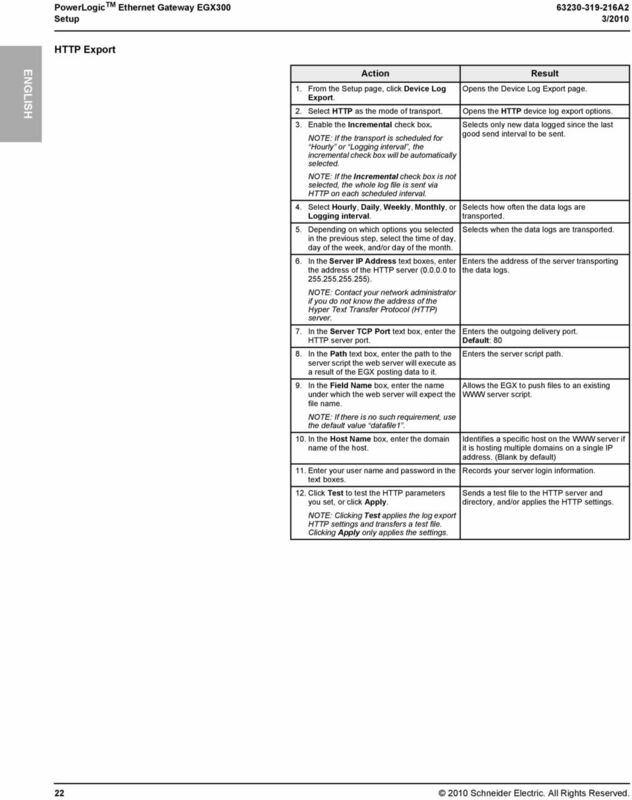 Quick Scan Features Setup Guide. Scan to E-mail Setup. See also: System Administration Guide: Contains details about E-mail setup. EOS Step-by-Step Setup Guide Wireless File Transmitter FTP Mode Infrastructure Setup Windows XP 2012 Canon U.S.A., Inc. All Rights Reserved. Reproduction in whole or in part without permission is prohibited.